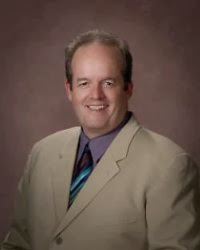 Michael P. Spradlin is the author of more than a dozen books for children, some of which have actually been published. He grew up in a small town in Michigan not far from the Indiana border, which may explain his irrational fear of Hoosiers (Both the inhabitants of the state of Indiana and the movie starring Gene Hackman, but not the Ninja). Michael is the author The Youngest Templar trilogy, The Spy Goddess series, and several picture books including the award winning Daniel Boone's Great Escape. He's also the author of such Ninja favorites as Every Zombie Eats Somebody Sometime and It's Beginning to Look a Lot Like Zombies! When not writing, he enjoys reading, traveling, spending time with his family and worrying over the fact that he really should be writing instead of doing other stuff. He lives in Michigan with his wife Kelly, son Michael, daughter Rachel and two dogs Willow and Apollo. Click here to read my review of Killer Species #1: Menace From the Deep. My very favorite book is Cannery Row by John Steinbeck. It surprises people when I say that because most consider his best work to have been done in the thirties. Or as my friend Christopher Moore says “In school they make you read all his books where everyone dies” like The Red Pony, Of Mice and Men and The Grapes of Wrath. Then, when you read Cannery Row, and you’re completely surprised by how funny and delightful it is. I like writers who love humanity, despite all of its flaws, and that to me is Steinbeck in a nutshell. He had a genuinely optimistic view of people that I find many of his peers at the time did not share. Lonesome Dove by Larry McMurtry is my ‘book I would take to a deserted island.’ It’s such an epic story and it contains some of the best dialogue ever written. And I also love The Great Gatsby by F. Scott Fitzgerald. Mainly because I wish I could write a novel with an ending as perfect as he does it in that book. Writing happens all the time. I don’t know if I could put an hour figure on it, but it’s a lot. My computer is always on except when I’m sleeping and sometimes I sit down in the middle of a chore or something and write a just a couple of sentences. Or a line of dialogue that pops into my head. But the answer is mostly a lot. Reading time varies and is really driven by my writing schedule. When I don’t have a deadline, I get to do more pleasure reading. When I’m writing or getting ready to work on a book, my reading is usually limited to something for research. But I still try to read for pleasure as much as I can. It’s a great stress reducer. It was a circuitous one. Growing up, I was surrounded by books. My mother was a voracious reader and, luckily for me, understood and appreciated the value of reading just for the sheer joy of it. I grew up in a small town so there wasn’t a lot to do, but luckily we had a great little library. After college, I worked as a bookseller and sales rep for a publishing company for a while and got a sense of what the marketplace was like. But I always wanted to write. One day I just said ‘It’s time.’ Started writing and submitting and got published. Both. I think some writers just have a gift. No matter how hard I try, I’ll never be able to craft a sentence a well as Fitzgerald or McMurtry or Steinbeck or write dialogue that crackles the way Elmore Leonard did. But I also believe (and tell students during school visits) that writing is a craft like any other and you get better at it by practice. I try to make sure my writing improves with each book. Like anything, the more effort you put into it, the more you will get out of it. I love being ‘in the zone’ when you have the characters voices nailed down and the plot is spinning. The words are coming so fast and furious you can barely type fast enough. It’s an adrenaline rush almost. That’s my favorite part. My least favorite part is turning the book in. I’m always rereading my books after they’re published and nit-picking myself. “I wish I had written this instead of that.” Or “I wish the character had done this, instead of that.” There is that old quote that ‘no book is ever finished it is only abandoned.’ Finally giving it up to your editor is hard. 1. Read. A lot. It helps you develop your voice. 2. Read outside your comfort zone. Try new authors and different styles and genres. 3. Write. I’m not a ‘you must write every day’ guy. No one has any kind of job that they never take a break from. When it gets hard and frustrating step away. Take a breather. But the important thing is to go back. Keep at it. Keep trying to improve. 4. When you think you’ve finished, go through what you’ve written and revise it. You’ll always find things you can make better. Eliminate excess adverbs and pronouns. Never use three words when one will do. Make your readers feel what your characters are feeling. Do the raindrops feel like pebbles or sand on their skin? Don’t tell them. Avoid lazy words. Like Robin Williams’ character in the movie The Dead Poet’s Society says, “a man is not very tired. He is exhausted.” One of the great things about the English language is the multitude of words we have to express feelings and describe things. Use them. Definitely Steinbeck. He lived during and chronicled such an extraordinary period in our country’s history. And I would love to ask him how his experiences and the way he lived and the things he saw influenced his work. Plus I read in his biography that in his last years he used to turn down the volume on the TV show The Wild, Wild West and make up the dialogue. It would have been the perfect after dinner activity.